You need your cookies turned on to use our Shopping Cart. The Sev Trek: Pus in Boots script is the final draft of the script used by all crew members of the Sev Trek: Pus in Boots Animated Cartoon. 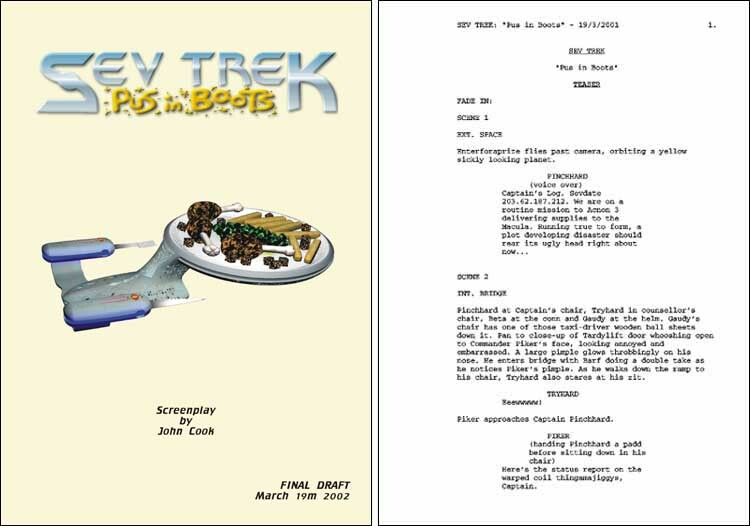 It features descriptions and actor directions, offering an insight into the production process and how writer John Cook intended to portray his Sev Trek world. The script is bound traditionally: printed on A4 plain white paper with card stock covers and bound with two brads. Click here to see a larger picture of this product.